We found these old tea chests hidden away in the corner of an attic and knew as soon as we saw them that they would be a fantastic addition to the home. With a little work and a padded fabric top, not only can they be used as bench seats but provide hidden storage, too. Spring is in the air, so it’s the perfect time to drag your home out of the winter doldrums and freshen it up with a coat of paint and a few bright new accessories. 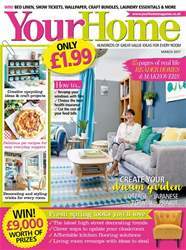 And, in this issue, we’ve got lots of affordable ideas for giving your home a quick facelift. On page 37 we take a look at this season’s hot new trends on the high street – from cool coastal vibes to edgy ethnic touches, fresh florals to touchy-feely textures, I know you’ll find a look you love. When it comes to the smallest room in the house (yes that’s right, the downstairs loo), it’s often a bit forgotten and unloved in the décor stakes, but that doesn’t have to be the case. Just turn to page 48 to see how small really can be beautiful! If your kitchen is in need of a revamp but you don’t want to change the units, then consider replacing the flooring. Take a look at our purse-friendly ideas on page 54 to see what a big difference it can make – without the hassle of ripping out your cabinets! Now the weather is getting a bit better, it’s time to start knocking your garden into shape so you can sit out and enjoy it over the months ahead. This month in our gardening section we take a look at some of the most popular garden styles – cottage, Japanese, formal and prairie – and show how easy it is to achieve them in your own garden (p.114). Last but not least, in our food pages this issue we’ve got some utterly scrummy pie recipes that I know you’re going to love (p.100). Trust me, the cheesy fish pie is to die for! We have £6,243 worth of fab prizes up for grabs! VISIT Your Home ONLINE TODAY! On sale now for just £1.95!